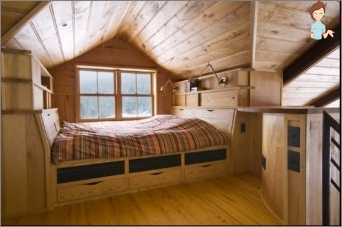 Bedroom in the attic for the inhabitants of the cityApartments - an unattainable dream. But the inhabitants of private housing construction have the opportunity to fall asleep, enjoying the view of the starry sky. Of course, if weather conditions permit. If the building is new, then lay a residential atticIt is necessary at the design stage. In the case when the house was purchased already ready, the room will probably be arranged not earlier than the repair in the attic will be carried out. Especially if the room was used as an attic. If the roof of the house is flat, there can be no question of an attic. It is impossible to equip a room and if the roof has a very steep ramp. The hip roof is the same tent, only stretched along the slope. In such a house, the rooms under the roof will be located sequentially. The most interesting option is in which the styles of the engineering structure are connected. Multi-deck roof allows creating a whole level of attic rooms. If before the attic served as a working room, it would be necessary to move the ventilation system, pipes and cables to another location. When it is impossible to heat the attic space, you need to think about installing a warm floor or an additional device for heating. 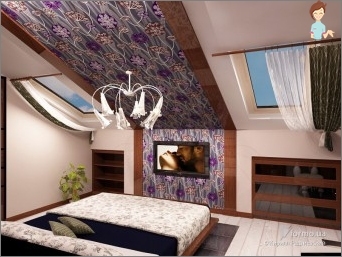 When the renovation of the premises is completed, you can begin to create a bedroom interior in the attic, guided by your taste and personal preferences. Finishing works are carried out proceeding from a design of a premise and representation about a cosiness. The finishing works in the room under the roof are carried out in exactly the same way as in the other rooms. They can be pasted with wallpaper, trimmed with lining, whitened, painted, decorated with wooden panels. Thinking about finishing the room, you need to remember: the presence of chamfered walls - the main highlight of housing under the roof. Therefore, the idea of ​​aligning the ceiling with hanging and tension ceilings is better to refuse immediately. Annoying sight ceiling beams can play one of the leading roles in the decor of the room - they are convenient to fix additional light sources. At the interior design of the atticConsider the following nuance. Because of the typical for this room inclined walls, the ceiling passes naturally to the wall overlap. Therefore, it is desirable that the materials from which the floor and the inner covering of the roof are made are combined in texture. It is rare to find large attic rooms in the area. Skillful design can expand the space, make the room higher visually. If you buy low furniture for a bedroom - you should pay attention to the Japanese or Chinese style - then the ceilings will seem higher. Wonderful fit in the interior of a smallRooms squat pedestals, narrow lockers. Won looks like a wardrobe with a beveled top. It should be ordered specially. When there is a similar piece of furniture in the room, it looks more stylish. Do not place the bed in a corner, where the heightCeiling will be minimal. It looks like this design solution is beautiful, but when you wake up at night, you can forget about where you are and sharply rise in the dark, get hurt. It is more advisable to place the bed under the roof slope. And to feel more comfortable, install a canopy. 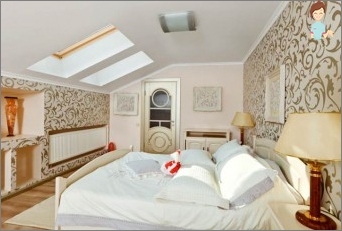 In the decoration of the bedroom in the attic is very important role of color. A small room will visually appear wider,If for its coloring choose light colors that smoothly flow from one to another. If this design seems boring, it will be enough to add a few bright additional details. It can be colorful curtains, decorative pillows, bright puffs. 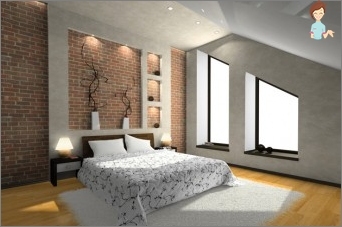 The advantage of this bedroom design - if bright spots are tired, they can be replaced by more calm interior details. Stationary bright decoration will require general repair. When painting the walls of the room in contrasting colorsIt should be borne in mind that due to the original sources of light - windows and lamps are often placed under the roof or on inclined beams - the colors in different parts of the room are markedly distorted. Do not block the attic furniture, otherwise it will look like an attic. In the summer time, the room is additionally lit with sloping windows. If the bright light can interfere, you can install the blinds. Bright sunny walls tones in combination with a bright sun every morning are able to make "Kind"! 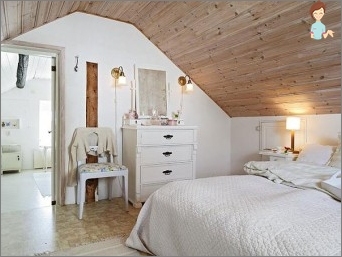 What else can you advise interesting to create an original interior of your attic? It can be arranged in a rustic style, having been trimmed from the inside with a rough clapboard or laminate "under the tree". On the floor throw rugs in the style of patchwork or skins. It will be interesting to look a bedroom, if the walls are made of matte-light, and the sloping ceiling is painted with glossy white paint. The room will visually deepen. The possibilities of decorating the bedroom under the roof are many. But a cozy room will be only if enough attention is paid to preparatory work. In the winter, the bedroom under the roof is the coldest place in the house, in the summer - the hottest. Without installing a reliable thermal insulation, it is impossible to create comfortable conditions in the attic.